The shift to the old library building will be welcome news for postal customers who must now travel to Vineyard Haven. Parking arrangements are in place. A crew was hard at work Sunday afternoon on the roof in Post Office Square, Edgartown. As early as the end of next week, the Edgartown Post Office will operate out of the Carnegie building on North Water Street, town administrator Pam Dolby confirmed Thursday. Ms. Dolby told The Times she had reached an agreement with the U.S. Postal Service to shift operations to the former library building following the sudden closure of the Edgartown Post Office last Friday due to rain leaks. Edgartown officials announced there will be two handicap accessible parking spaces in front of the Carnegie building when the Edgartown Post Office relocates to the former library location on North Water St. The town will also provide 15 minute postal customer parking that will extend on North Water St from the old library to Morse St, then continue up Morse St. A move date from Vineyard Haven has not been confirmed yet. That will be welcome news for Edgartown postal customers who must now travel to the Vineyard Haven Post Office to pick up their mail. 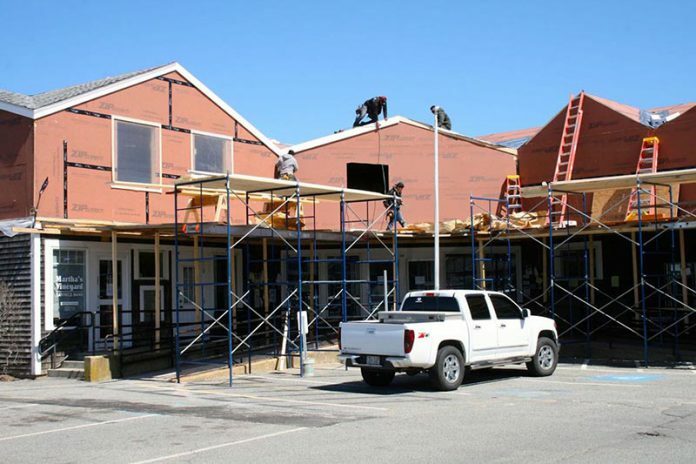 Ms. Dolby told selectmen on Monday that the post office building would have to be completely gutted, insulation would have to be removed, and fixtures replaced and rewired. In an e-mail to The Times Thursday, Ms. Dolby said the Edgartown Post Office in the Post Office Square complex is expected to reopen by June 1. Earlier this week, Mr. Hajjar apologized for the sudden post office closure and said he will help fix the damage. “The Trust certainly recognizes that this is an emergency for the town,” Preservation Trust executive director Chris Scott told The Times in a telephone conversation late Thursday. Mr. Scott said there are many elderly people and people without vehicles who have been inconvenienced by the closure of the Edgartown Post Office. He said the Carnegie building, which the Trust plans to turn into a visitor center, was available. “Landmarks are best when they are used,” Mr. Scott said. Mr. Scott said it is his understanding that the town will carve out short term parking for the duration of the temporary move. He said he will not be involved in the details of the new set up, which must follow strict Post Office protocols. A Postal Service team is expected to arrive next week to evaluate the building and facilitate the set up of a temporary Post Office.